Diaphragm pressure gauges are preferably used for low pressure ranges. Through the large working surface of the circular, corrugated diaphragm element, small pressure ranges can be measured reliably. 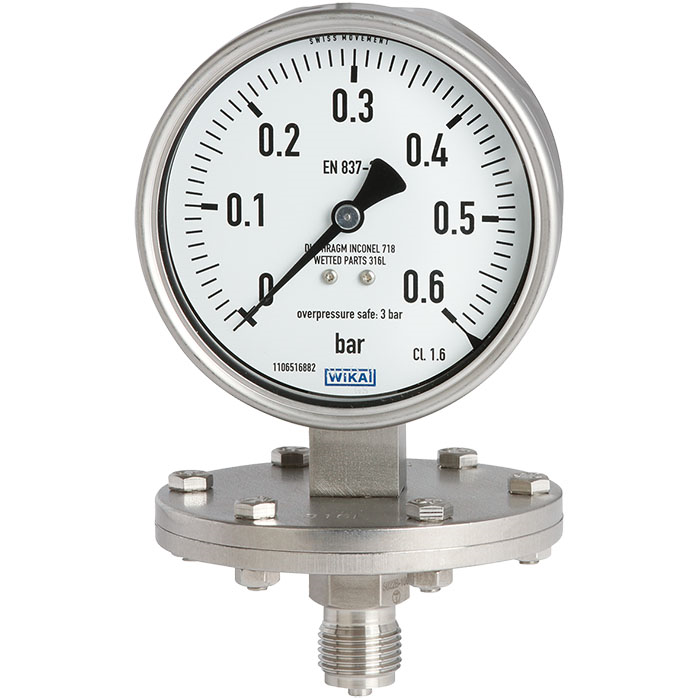 The model 432.50 diaphragm pressure gauge is manufactured in accordance with EN 837-3. The high-quality design is particularly suitable for applications in the chemical and petrochemical industry, oil and gas industry and power engineering. The case and wetted parts from stainless steel fulfil high requirements for resistance against aggressive media. For especially high resistance requirements, the pressure chamber of this diaphragm pressure gauge can, as an option, be designed with a wide variety of special materials such as PTFE, tantalum or Hastelloy. For the measurement of highly viscous, crystallising or contaminated media, the use of an open connecting flange is recommended. The open connecting flange has the advantage over a threaded connection that the pressure port cannot become blocked. With an additional flushing connection on the open connecting flange, the pressure chamber can be easily cleaned. Measuring systems with diaphragm elements, on the grounds of their design, offer good protection from overpressure, since the diaphragm can support itself against the upper flange. As standard, the model 432.50 diaphragm pressure gauge already features an overload safety of 5 times the full scale value. Optionally, higher overload safeties can be realised.